What did I do ultimately to get into shape for the 40k timetrial? -First and foremost I determined my FTP. -It means Functional Threshold Power and describes the maximum power an athlete can maintain over one hour. What did you do to determine the FTP? -Simply I could have gone out cycling one hour as fast as I can. But no. I didn´t. This would have been too hard, too exhausting and too boring. 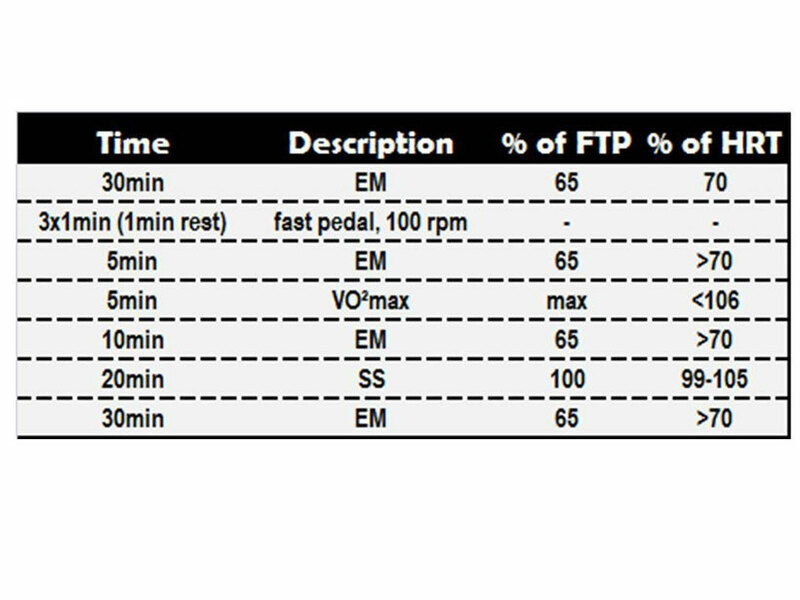 "Training and racing with a powermeter"
The core part was the 20min interval that you see in the table. So after this training session I connected the training data and mostly the power data to my PC. With the help of Garmin Connect I uploaded the training data as a TCX-file into the training analysis tool Golden Cheetah. With the help of this program, which is freely available since it is Open Source, I analyzed the average power output within this 20min interval. Following I multiplied this value with 0,95. This is done because the authors of the before mentioned book have seen in studies, that the average power the most people push in 20 minutes is 5% higher than what they can maintain during one hour. I don´t hide anything to you. So I tell you, that my result from this was a FTP of 264. Roughly calculated this means my Watts per kilogram bodyweight are around 3,6 at the moment. I hope I am able to raise this during the season. I also believe that it should be possible. Since I only started training after a one week break. If you want to see in detail how to measure your functional threshold power or FTP go to the video that I that I posted on my Youtube Channel. Here I will talk about everything you need and what is necessary to do to determine your FTP. -Now, I don’t leave it with knowing my FTP. Instead I am already using it in my training sessions to make up training zones that I use for my interval training. In my next blog post I will talk about the training zones in detail. Hier geht´s zu den neuen Sports.Punk - Shirts --> Natürlich nachhaltig! Das nachhaltige SportPunk Bike Jersey ist jetzt im Shop erhältlich.